These Tex-Mex rancheros hot dogs are a genius twist on your regular summer dogs. Piled high with sharp cheddar, black beans, salsa, and avocado you can’t possibly not completely inhale them. If Kyle was stranded on a deserted island and was forced to choose only 3 foods to eat for the rest of his life, one of them would most certainly be pork. I’m pretty sure the other two would be pork and pork as well. And since “pork” covers a huge variety of different food (he would make this choice by design), he wouldn’t need to be picky as long as there were hot dogs. I swear, I could leave him with only a package of hot dogs for a weekend when I’m away and he would be perfectly content. Not that I would or anything, but still. I mentioned last summer that I prefer weekend lunches to be really simple and these Tex-Mex rancheros hot dogs fit the bill. And they made Kyle suuuuper happy. 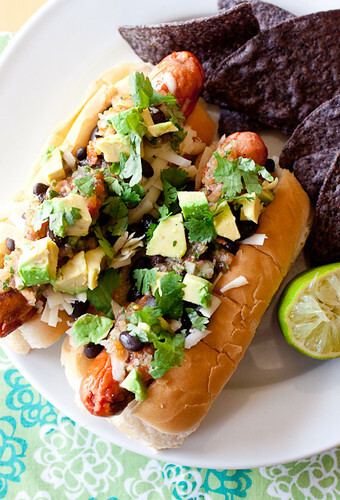 We piled a few grilled hot dogs sky-high with Cabot’s New York Extra Sharp Cheddar salsa, chopped avocado, black beans, and cilantro and man…these were some killer hot dogs. If you’re a Tex-Mex lover, you’ve probably eaten huevos rancheros and this is where I pulled my inspiration from so I knew all of the flavors would be perfect on top of an often plain ol’ boring hot dog. Grab your napkins and fire up the grill because you’ll want these messy rancheros hot dogs sooner rather than later! Disclaimer: Cabot provided me with a sample of a few types of cheese but I was not compensated for writing this post. All opinions are my own. Preheat grill to medium-high heat and hot dogs according to your preferences and place them on the buns. Divide the rest of the ingredients between the 8 hot dogs along with a squeeze of lime on top and serve hot. LOL, Shane’s the same way – he would be thrilled if he got to eat hot dogs for an entire weekend. He’s just a mustard guy, but I’d be all about these toppings – yum! I’m gonna have to agree with Kyle here – these hot dogs look amazing. Nice twist on a fun meal for Cinco de Mayo! We had these for dinner last week, and they were awesome. I made a half batch of the topping, and we had leftovers so I put it on top of salads and served them with some of Ina’s ranch dressing. Oh my gosh, it was such an awesome meal. Hot dogs and salads with tex-mex flavors. Who would’ve guessed?